A Container manages how the contents of an HTMLElement fills the available width. The contents can be confined to a fixed width (with margins), or the contents can be fluid and expand to fill the whole width. Fluid vs fixed containers on a site. Different areas of a page may be laid out using different Containers. For example, a header and footer area that both stretch the entire viewport width, with a centered, fixed content area inbetween. A responsive layout arranges its contents differently, depending on the size of the device it is being displayed on. For example, a Nav with many options displays on a cellphone as a list of options stacked op top of one another. On a large screen, it spreads the options in one row across the screen. Use a ColumnLayout to control how your layout adapts to different sizes of device. A ColumnLayout adds a number of visual columns to a Div. Add Widgets into each of the columns to control where they will display. The width of each column is stated in 1/12ths of the total width of the containing Div. If the total width of all the columns is more than 12/12ths, the extra columns flow over to a new line. 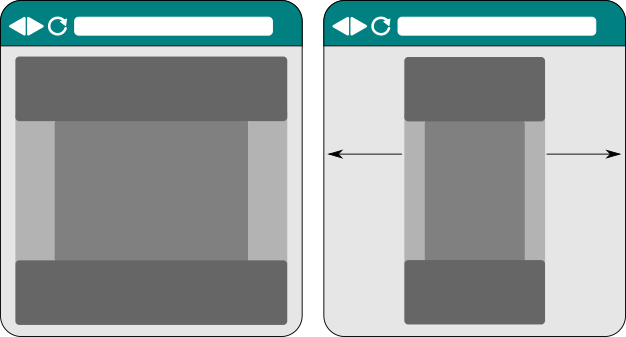 A ResponsiveSize contains all the different sizes to use for a column on different devices. 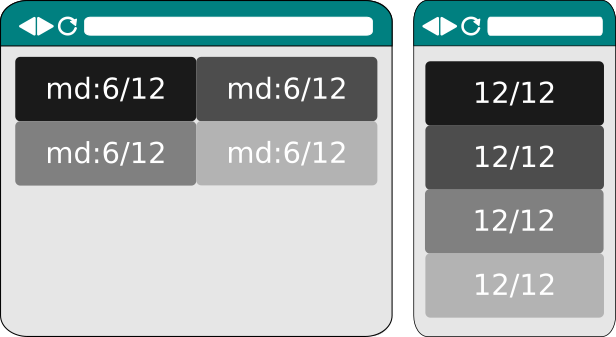 Columns with ResponsiveSize(lg=6) on a large device, defaulting to 12/12ths on a small device. ColumnLayouts need to be nested inside something with a Container layout. A PageLayout prepares a page so it has a header area at the top, a footer at the bottom, and a content area in between. Use a PageLayout in conjunction with with a suitable ColumnLayout to further split the content area into different columns.